To contact Cliff Holden see the Contact Me page. To purchase works by Cliff Holden see Modern British Artists (London) and Wendy J Levy Contemporary Art (Manchester) or contact Cliff directly. Also contact Cliff for further information about prices, exact sizes etc. For a preview of selected paintings and drawings by Cliff Holden currently for sale at Modern British Artists see Gallery: Currently for sale at Modern British Artists. For details of painting and drawing courses see Hazelridge School of Painting. New commissions undertaken: large scale murals, decorative panels and textiles for public buildings, ships and private homes - see Marstrand Designers. To read a short biography and view further information about Cliff's career see Profile. Cliff has been awarded the degree of Honorary Doctor of Letters by London South Bank University (formerly Borough Polytechnic) in recognition of his work and in particular the promotion of the University through his work. 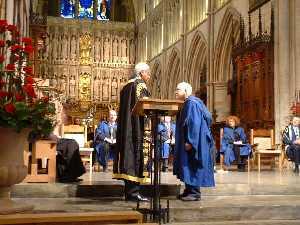 At an Honorary Awards Ceremony held at Southwark Cathedral on Wednesday 15th November 2006, the Citation was read by Pro-Vice Chancellor Phil Cardew and the Honorary Doctorate was conferred by Chancellor Sir Trevor McDonald OBE. Cliff has two prints in the 'Metavisual Tachiste Abstract / Painting in England Today 1957 / A Fiftieth Anniversary' exhibition. They are 'Standing Man' 1954 and 'Two Seated Figures' 1957. The Redfern Gallery is at 20 Cork Street, London W1 and the exhibition runs from 26th June to 26th July 2007. This is a unique collection of paintings and drawings by David Bomberg (1890-1957) and members of the Borough Group: Cliff Holden (b.1919), Miles Richmond (1922-2008), Edna Mann (1926-1985), Dorothy Mead (1928-1975) and Dennis Creffield (b.1931). The collection also includes works by Thomas Holden (b.1957) and Evert Lundquist (1904-1994). The collection was donated in trust to London South Bank University in 2008 by Sarah Rose, an independent and noted collector. In 2011, the university received a grant from the Heritage Lottery Fund to renovate part of its Borough Road building for use as a gallery and to devise a programme of exhibitions and events exploring the collection. 'A David Bomberg Legacy - The Sarah Rose Collection' opens to the public on Saturday 23rd June 2012. See details of current and past exhibitions. See gallery opening times and map. I am motivated by an urge to explore and define nature. As a painter, I have used philosophy both as a stimulation and as a justification for the activity of painting, and I have found many parallels between the philosphical problems of art and those of science. A painting can be made in different lights; it exists in relation to light. But it also exists in relation to mass. Consider how a painting changes when it is turned upside down, or even what a difference a slight tilt of the head can make to our sense of the world. The Danish physicist Niels Bohr said that science couldn't tell anything about the world AS IT IS IN ITSELF. We cannot ask the question in the form of "WHAT IS IT ... ?" - but we can show how we INTERACT with the world, how we interact with things. I think this is what Christopher Neve meant when he described Bomberg's interaction with landscape: "David Bomberg did not only respond to landscape: there is a fervent sense in which he became it." He did not observe the motif and try to remake it as some kind of equivalent. He became it. Alan Watts has said something similar, to the effect that you do not have a sensation of the sky; you ARE that sensation. There is no YOU apart from what you sense, feel, and know. Perhaps this goes some way to explaining Cézanne's phrase, "my little sensation", and Bomberg's phrase, "the spirit in the mass". As a result of discussions with David Bomberg, Cliff Holden conceived the idea of the Borough Group which was established in 1946. Other founder members of the Group were Edna Mann, Dorothy Mead, and Peter Richmond. Holden was nominated and elected the first President of the Group during 1946-48. The Borough Group was active for five years until disbanding in 1951, by which time they had organised more than seven exhibitions. The purpose of the Borough Group was to work out the ideas that Bomberg promoted, and provide a platform for furthering those ideas. During the years 1952-62, Cliff Holden contributed articles to: Konstrevy, Paletten, Konstperspektiv, Art News and Review, Studio International. He also gave BBC Radio talks on Bomberg and Swedish art. Holden's memorial tribute to David Bomberg, broadcast on the BBC Third programme in 1958, was described a decade later by the art critic David Sylvester as 'the most useful analysis of Bomberg to have appeared'. For many years, Holden has promoted cultural exchanges between Sweden and England, and he was instrumental in bringing the work of Evert Lundquist to international attention. Since 1956, Cliff Holden has lived and worked as a painter in Sweden. He founded a design studio together with Lisa Grönwall and Maj Nilsson, which moved to Marstrand in 1959. The trio became internationally known as the Marstrand Designers and received many awards. In 1984 the studio moved to a village near Falkenberg. There Holden additionally established a school of painting and drawing - the Hazelridge School of Painting - Hässlås Målarskola - where Holden continues to paint and also inspire visiting art students.